ViewSonic seems to be Androided! 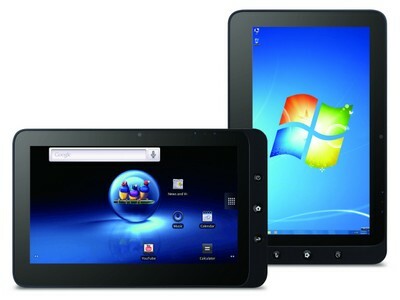 The tech giant has unveiled 2 different editions of the tablets, both Android based. ViewPad 7 and ViewPad 10 are proud to enter the tablet family with one of them being tagged to be released later this month. We bring you details on both the intelligent gadgets, starting with ViewPad 7 which is a 7-inch Android 2.2 tablet, due to be released late November. ViewSonic even released the prices on the product with the ViewPad to go one sale at $479. The ViewSonic ViewPad 7 is powered by a Qualcomm Snapdragon processor with 512Mb of integrated memory and a microSD slot. Furthermore, the device powers the internet over Wi-Fi (b/g) but also with 3G capabilities if you want it to be powered by your SIM. The ViewPad is a multi-touch screen, having a resolution of 800 x 480 and is faced by a rear-facing 3-megapixel camera and a 0.3 megapixel camera at the front. The strong gadget delivers a 10-hour battery life, which surely is long enough for a session to last. The second tablet which ViewSonic made public is the ViewPad 10 with due time to be released somewhere in 2011, priced more heavily at $629. The ViewPad 10 comes packed with a 10.1-inch screen, sporting a LED backlit with a resolution of 1024 x 600, quite similar to the iPad. This part of the tablet has a dual-boot feature which can make a jump between Windows 7 Home Premium and Android 1.6. Furthermore, the tablet is backed with a 1.66 GHz Intel Atom Processor, integrated with 1GB memory, a 16GB SSD Drive, and a microSD expansion slot. The ViewPad 10 also delivers a multi-touch feature with a front-facing camera of 1.3 megapixel for video chat.